Although documenta packs up and moves out at the end of its 100 days, each edition of the festival changes the city and leaves something behind. Artworks from previous exhibitions have been embraced by Kassel‘s inhabitants, and visitors can follow three walking routes to discover the relics of festivals past. Most of these artworks were intended as temporary exhibits, but 16 prominent installations dating back to documenta 6 in 1977 have been preserved through donations, gifts or purchases. As representatives of the history of the art exhibition and examples of contemporary art at their specific moment of creation they offer interesting insights into the world of art. Visit www.documenta-history.com for information on all artworks; the free audiotour app at www.izi.travel/en has these three walks available in English, Spanish and French. 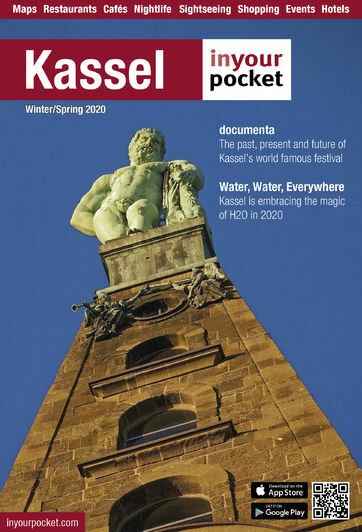 Alternatively, pick up the free 'Experience documenta History' map with artwork descriptions at Kassel's tourism office. Best known and most visible of all the public artworks is perhaps Joseph Beuys' 7000 oaks project from 1982. Beuys provided a big pile of 7000 granite stone pillars in front of the Fridericianum for planting next to new oak trees. These pillars can now be seen matched with trees all over Kassel, which as a result is a much greener city thanks to Beuys who raised a large part of the required funds himself. It took five years to work the pile away; the last tree was finally planted beside the first one in 1987. In 1977, Walter de Maria had a kilometre-deep well drilled in front of the Fridericianum and filled it with brass rods; the Virtual Earth Kilometre can only be recognised as a small piece of metal in the pavement; the conceptual artwork below mindblowingly exists mainly in your mind. Nearby, Thomas Schütte‘s 1992 Die Fremden ('The Strangers‘) statues overlook Friedrichsplatz from the roof of the Sinn Leffers department store. At night, Horst Baumann‘s Laserscape installation from 1977 is visible across the city: strong green and red laser beams shoot from the Fridericianum towards the Bergpark and several other important Kassel sights. Texan artist Max Neuhaus installed his Three to One electronic sound installation in the striking 1950s stairway of the AOK Hessen office building on Friedrichsplatz 14 in 1992; over three storeys it undergoes a series of slight modifications with each level assigned its own sustained tone and timbre. Start this route with a peek through Hans Rucker‘s 1977 Rahmenbau slide frame beside the documenta-Halle, nicely framing the view of the Karslaue park, where Guiseppe Penone's Idee di Pieta (ideas of stone) is a bronze tree supporting a large boulder, installed for the 2012 festival. Jimmy Durham’s Arkansas Black Apple follows the documenta tradition of planting trees; set in the Karlsaue cherry orchard in 2012 it reminds the artist of his youth and was originally accompanied by a Korbinian's Apple Tree that was vandalised. Near the Orangerie, at the spot where the Wilhelmshöher Allee axis meets the Fulda, an oversized pickaxe sticks out from the grassy riverbank; this is Claes Oldenburg‘s Spitzhacke project from 1982, left standing as if it were tossed there by Hercules, perched in his Bergpark viewpoint at the other end of the axis. Per Kirkeby's anonymous and accessible brick Raumskulptur behind the documenta-Halle allows visitors to weave in and out of the functional sculpture, experiencing compactness and transparency. The city centre walk kicks off beside the Neue Galerie at Ulrich Rückriem's minimalistic Ein Granitblock sculpture from 1982, complete with scars left by the techniques of splitting and cutting it up. Lawrence Weiner's wall painting Die Mitte Von Die Mitte Von Die Mitte Von at Friedrichstraße 25 refers to the intentional lack of centre or focal point of the 2012 documenta festival. In front of the Hauptbahnhof station, Jonathan Burowsky‘s 1992 Man Walking to the Sky is a local Kassel favourite, the figure running up the pole becoming a symbol of hope for the city – and of futile efforts. Inside the station, you can lend a portable media player from the Offener Kanal and follow Janet Cardiff and Georges Bures Miller's 2012 Alter Bahnhof Video Walk to witness the history of the railway station in text, video and images. On the disused track 1, Lois Weinberger installed the botanical artwork What is Beyond Plants is at One with Them in 1997, letting plants from southern and southeastern Europe outgrow and displace the original flora – referring to social processes of global migration and the conflict between foreign and native. A short trip by tram or train to Kassel-Wilhelmshöhe station brings you close to Anatol Herzfeld's Dreamship Aunt Olga from 1977 at Freiherr-vom-Stein-Strasse 11; a fantasy folded paper boat stranded in a meadow. The artists actually sailed from the North Sea to Kassel in this vessel in time for the start of documenta 6.